The Eagles have announced dates for a spring 2019 tour of the UK and Europe. The month-long run will open in Antwerp, Belgium on May 26 and wrap up with a series of UK concerts and a July 6 event in Dublin, Ireland. Tickets for the tour will go on sale Friday, October 5 at 9am via the usual outlets. The 14CD/DVD/Blu-ray package presents all seven of the California band’s studio albums, three live albums, and a compilation of singles and b-sides alongside a pair of concert films: 1994’s “Hell Freezes Over” on DVD and 2005’s “Farewell Tour: Live From Melbourne” on Blu-ray. A 15LP version of “Legacy” – which presents all of the music from the CD box without the video content – marks the vinyl debut of the 2000 “Millenium Concert” release and the long-awaited return to vinyl of 1980’s “Eagles Live” after being out-of-print for decades. Both sets are housed in slipcases and accompanied by a 54-page hardbound book filled with rare and unseen photos, memorabilia, and artwork that encompasses the band’s entire career. 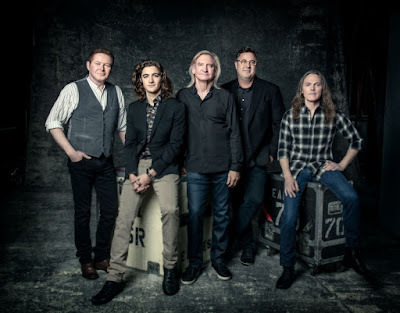 The Eagles – Don Henley, Joe Walsh and Timothy B. Schmit, with Deacon Frey and Vince Gill – are currently playing shows on a North American tour that will finish at Aloha Stadium in Honolulu, Hawaii on December 7.